Today I went to a spa to get a facial because my skin is constantly dry, and I’m in the need of some relaxation. I recommend it to anyone that suffers from some, all, or none of those things. The spa doubles as a place for cosmetic surgeries, offering eyelash lengthening, laser hair removal, and lifts. Be Your Best immediately grabbed my attention, especially now that I started up this blog, but then I read a little closer. 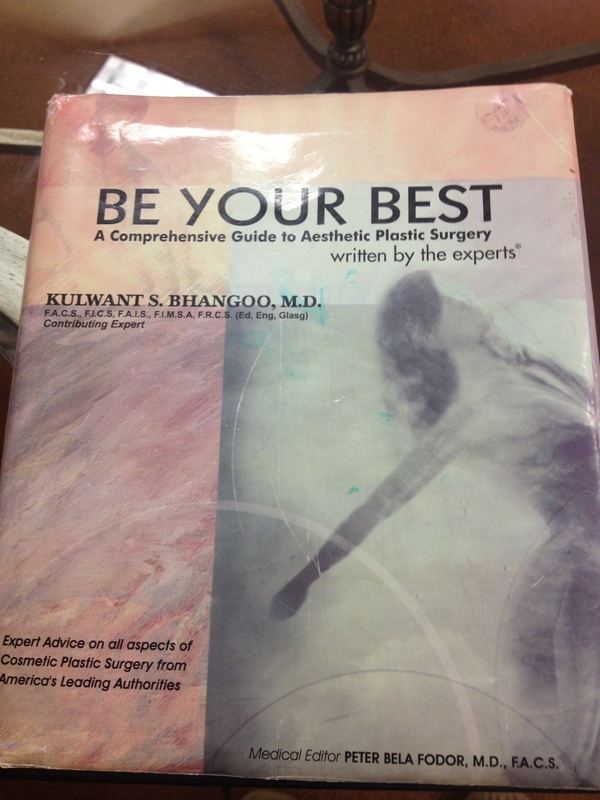 A Comprehensive Guide to Aesthetic Plastic Surgery made me frown. Did I really need to rely on a surgeon to become my best self? I will admit, I’ve had those thoughts before – to save up money and get a liposuction surgery. But, once I started seeing results from healthy living, it got pushed to the side, but still resided in a small section of my brain that rarely gets used (like the atomic number for Iron, or the proper use of the Oxford Comma). Let’s be honest – I’m from the generation of “instant gratification,” expecting results now now now, so why not go under the knife and solve all my problems in a half hour? As I was waiting, I flipped through the book past the face lifts, and neck reconstruction to the chapter on liposuction to learn some more about it. Now, I’m not discrediting this sort of surgery, because in a lot of situations it’s the right choice, but I knew that for me, personally, it was the wrong one. I was reading through about who is a good candidate, the complications, and the recovery, and solidified in my head that I’m on the right track. This sort of surgery is ideal for those who have genetically-designed areas of fat that won’t slender up (or disappear) with diet and exercise, and good enough skin to recover after it’s all said and done. Erica —- Now I am calm and relaxed, and my skin looks great!